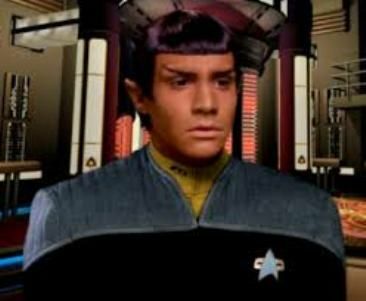 While at Starfleet Academy, Taurik had the opportunity to review preliminary findings by Doctor Nils Diaz. He discovered that causing the plasma flow in the warp nacelles to become out of sync increased overall warp field stability. Using Diaz's work, Taurik designed modifications to the warp drive of the Galaxy-class Enterprise-D in 2370 which increased its warp field stability by seven percent. He was eager to begin field tests on this and a number of other enhancements under the auspices of Lieutenant Commander Geordi La Forge. La Forge was irritated by the upstart ensign, who was also extremely inquisitive and perceptive. La Forge had Taurik help him damage the shuttlecraft Curie, claiming that it was part of a hull resiliency test. Taurik recognized that the phaser blast patterns were consistent with making it appear as if the shuttle had fled an attack, although he also realized that La Forge wanted him to keep quiet about the task. La Forge later decided that Taurik was not annoying him on purpose, and invited him to Main Engineering to begin work on the engine modifications. After Sito Jaxa left the Enterprise-D on a covert mission to Cardassian space, Lavelle tried to get more information about her whereabouts from Taurik, but he remained silent. While surveying Bell-B the Colorado was struck by a plume of gas released from the moonlet which heavily damaged the runabout and caused it to collide with the moonlet. With Doctor Aaron killed and Lieutenant Commander Data incapacitated, Troi and Taurik were forced to make emergency repairs to the runabouts communications and propulsion systems. The team were later rescued by the Enterprise after she returned from the Chandra colony. Following the Enterprise-D's destruction at Veridian III in 2371, Taurik was among the many former Enterprise crew members assigned to the Utopia Planitia Fleet Yards. Taurik was later assigned to the USS Ilan Ramon, where he remained for the duration of the conflict. In 2378, now a full Lieutenant, Taurik was assigned as gamma shift engineer aboard the USS Enterprise-E, once again under the auspices of Geordi La Forge. In 2379, he commanded the Echo team mission to infiltrate the nadion-pulse cannon firebase located in the Linoka Forest on Tezwa.